Michael VerSchneider, volunteer coordinator of the RCC Food Cupboard and student volunteer Richard George are standing in the small room filled with cans and boxes of food donated by the Regional Food Bank, to be distributed to students affected by hunger and food insecurity. 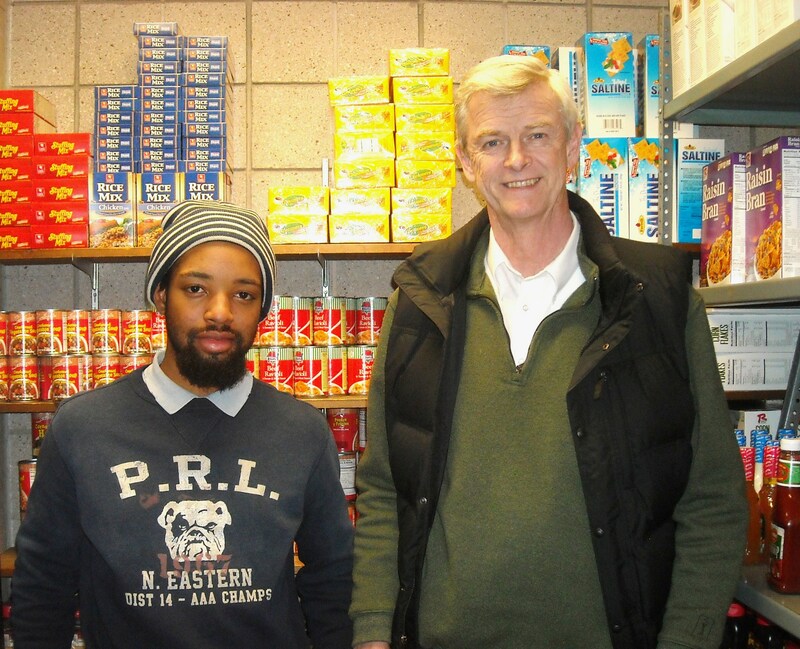 The Rockland Community College [RCC] Food Cupboard is part of the county’s safety net for those in need. The food collected and warehoused at the Regional Food Bank is distributed to qualified 501(c)(3)charities that feed the hungry throughout northeastern New York organizations such as food pantries/cupboards, soup kitchens and emergency shelters. These charities, called member agencies, receive food from the Regional Food Bank and give it to those in need. Higher education holds more value today, so student enrollment is on the rise along with food insecurity. For most people, earning a college degree is the initial step towards developing a career and financial security. Many community college students that struggle with food insecurity have paying jobs, where many of them work many hours a week. They have student loans, must pay for rent, tuition and books, therefore, they have little left in their pay checks to pay for food. The October 2016 “Hunger on Campus” study surveyed 3,765 students and found 48 percent had experienced some form of food insecurity in the past 30 days. Of those, 22 percent had experienced severe levels of food insecurity, enough to be considered hungry. Many had to choose between educational expenses (tuition, books, supplies) and purchasing food. Food insecurity can be identified by many factors including: worrying that food will run out, purchasing food that goes bad too quickly and not being able to afford more, eating less than desired in order to save it, not eating food for fear of running out of food and not being able to afford balanced meals. Stigma is the biggest hurdle for schools looking to assure that students get enough to eat. Getting students to use the RCC Food Cupboard requires some assurance that they will treated with respect when they get there. There are some students who don’t want to admit that they may not have enough money for food for the month. There is a stigma about using food cupboards and receiving charity and donations. A lot of students at RCC are adults and believe that they should be able to take care of problems on their own. Recently, the family of late Spring Valley resident Nathaniel Jackson made a donation in his memory to provide food vouchers for the RCC Campus Café for students in need. In addition, the donation includes $1,000 for infrastructure improvements to the RCC Food Cupboard. A future goal is to add refrigeration units to expand the service that includes perishable food items. Dr. Michael A. Baston, who took over as RCC President in July, 2017 has also moved the college forward on this front. Dr. Baston frequently addresses topics such as food insecurity and was a featured speaker during October 2017 at a national conference on the issue.